If I’ve learned anything in my many years in the beauty industry, it’s that the tools you use really do make the difference. 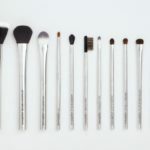 You can own the most luxe makeup on the market (think Cle de Peau or Chanel), but if you are applying with merely Q-tips or applicators that come in your compacts, you’re missing out on the real beauty of the product. 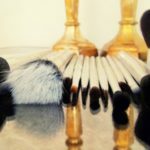 That’s not to say that there is never a time to use a Q-tip to apply eye-makeup (in fact, I love using Q-tips when I create the under-line in a smoky eye), but as with all rules, think of these as exceptions, not as the rule. 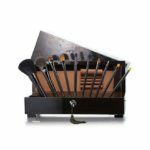 I’ve interviewed many makeup artists in my career as a writer and editor and, when it comes to makeup, the only point that is unanimous is this: makeup application is an individual preference. How you choose to apply your makeup is purely personal. Some artists use their fingers as they feel they have more control over the look by blending and blotting with their hands. Others, never touch a face with their fingers as they believe that there are too many bacterias that are then transferred to the skin. 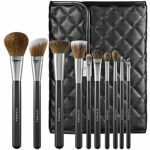 But I think that all will agree, there are a few basic brushes that are necessary in every makeup bag. Powder- The beautiful dome shape of this full, luxurious brush ensures that powder will go on flawlessly, just like an airbrush. Swipe the brush over powder, then smooth over skin to quickly apply a light dusting of powder all over the face. Use the powder brush to apply Pure Press onto bare skin for a sheer finish, or as a setting powder over Skin Tint Crème. Also great for those times when perhaps you’ve applied a bit too much blush…soften the color with the Powder blush and a light dusting of Pure Press over the blush. 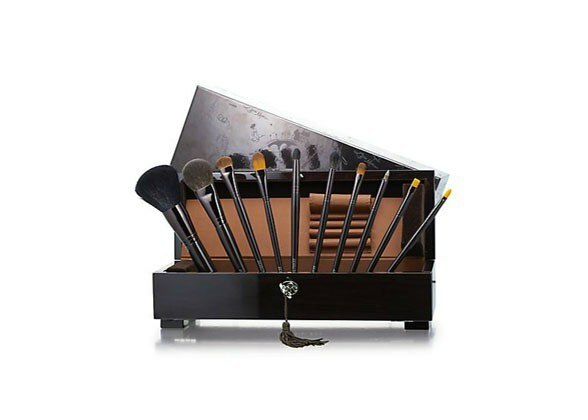 Instantly transforms any makeup application into a polished work of art. Face Blender- This is truly a multi tasking brush. It’s great for applying just about anything from foundation and powder to bronzer and blush. This round, synthetic brush ensure a lightweight, diffused application of color. Simply dip the white tips of the Face Blender brush into foundation or color and, while working in circular motions, begin applying the makeup to your face to deposit a transparent, sheer application. Excellent for layering blush and bronzer as well. The result is a natural, seamless application. Blush/Contour- Beautifully tapered blush brush creates naturally flushed cheeks in an instant. The slightly domed shape softly contours face without detection. Lightly tap the top of brush into blush duo and beginning at the perimeter of the face, work your way towards the center using concentric circles. Add a pop of color to the apples of the cheeks using the flat side of the brush, stippling for saturation. Foundation- Since most people generally have the greatest discoloration around the center of their face, I suggest you begin there and work your way out. Pump a few drops of foundation onto the back of your hand and dip the flat side of the foundation brush into it. Then, starting just below your eye, begin applying foundation in downward strokes. Lightly feather your strokes to evenly blend into the skin, working towards the perimeter of your face. Lastly, apply whatever is remaining on the brush to your nose, since too much product can look obvious there. If you feel there are areas that require additional coverage you can go over them with another layer. Since the brush is synthetic, it won’t absorb product like a sponge, so you get more life from your foundation with minimal waste. The result is velvety, smooth skin. Lip- This able brush is essential for precise lip application. Saturate the brush in lip colour or gloss and swipe over lips for a perfect pout. Use the flat side to drench lips in color, the tips to blend lip definers into lip colour. To simplify touch-ups, load brush with colour, replace cap and tuck into your purse for a quick, hassle free refresher later in the day. Eye Blender- Instantly bring harmony to eye makeup by blending colors together with this petal soft brush. Use to ease transitions between eyeshadow colours and soften contours. Also great for applying highlighter to the temples and down the bridge of the nose. Grooming- Smooth brows into submission with this brush. Perfect for combing brows into place and lifting the arch. Also makes an excellent groomer for men! Concealer- This is the perfect sized brush for really getting into the small spaces around the eyes and for precision camouflage work. To neutralize undereye circles, dip the flat side of the concealer brush into Diminish concealer and apply underneath the eye area from the lower lashline (where redness can often occur) to the edge of the orbital bone. Apply a light layer to the eyelids as well to even out the skintone and act as a shadow base. To hide skin imperfections, use the fine tip of the brush to stipple Diminish concealer directly onto blemishes. Then lightly dust Pure Press over to set. Great for cleaning up makeup mistakes as well. Use the concealer brush to sharpen the edges around lips and prevent color bleeding. Eyeshadow- Great for adding dimension to your eye makeup design. Saturate the flat side of the brush with eye colour and softly define the eyes, creating depth and drama. Use the tips to blend shadows together. Excellent for applying highlighter to the browbone or tear duct due to its small shape. 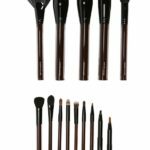 Small Crease- This brush takes the guess work out of how to apply contour colour. It fits perfectly into the crease of the eye. Just dip into shadow and wipe back and forth into crease to simultaneously define and blend eye colour. Flat Eyeshadow- This beautifully cut brush is your go-to brush for quickly laying down washes of color to the eyelid. The shape of the brush is perfectly suited for the eyelid and prevents shadow fallout due to its tapered design. Press the flat side of the brush onto lids to deposit uniform color. Utilize the tips of the brush to apply a strong contour to the crease area for a sculpted, defined look. Detail- This petite brush is fantastic for creating sultry, alluring eyes. 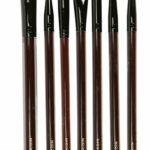 Use the tips of the brush to smudge eye definers for a smoky look or to add precise definition with eye colours to the crease area. Allows you to get very close to the lashline and apply shadow in the tight spaces between lashes. The soft hair won’t tug at skin and makes applying shadow liner a cinch. 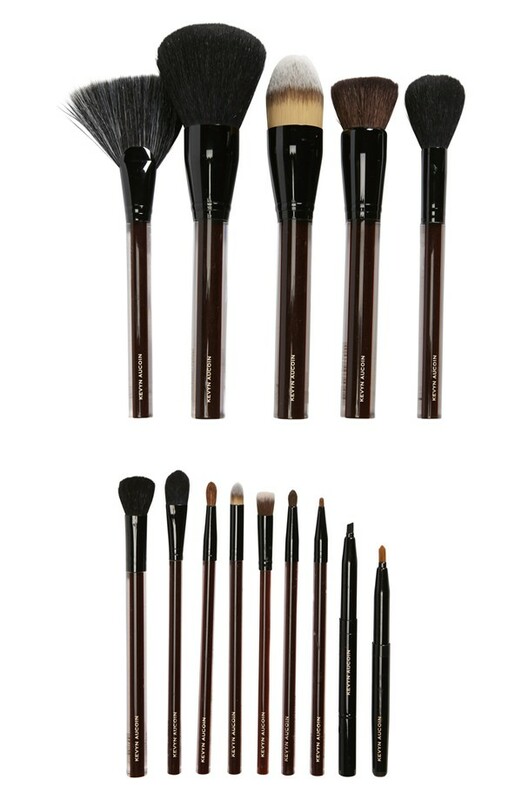 Angle Brow- This is THE brush for defining brow shapes. 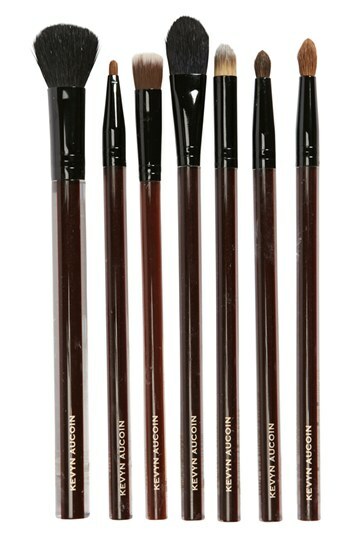 Use with eye colours to strengthen or extend sparse brows. The super soft hair will fill in brows naturally. Kabuki- This was the brush that started it all! The perfect partner to our Pure Press powders. Simply tap the brush into the powder and begin swirling over skin to achieve a satin, full coverage finish. It’s compact, domed shape makes application of powder quick, easy and foolproof. It’s convenient size makes it perfect for on the go touch-ups. 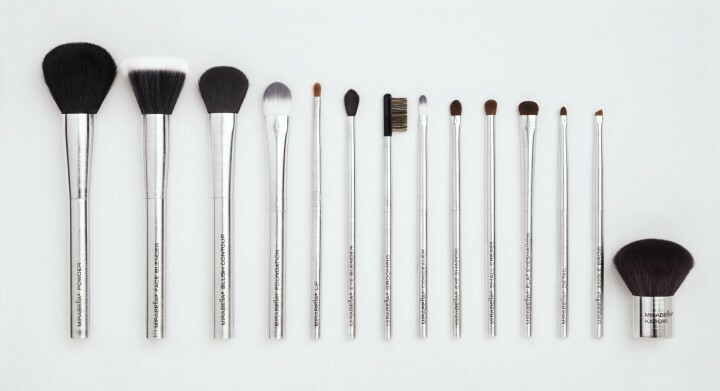 Professional brushes are an investment and one worth maintaining. 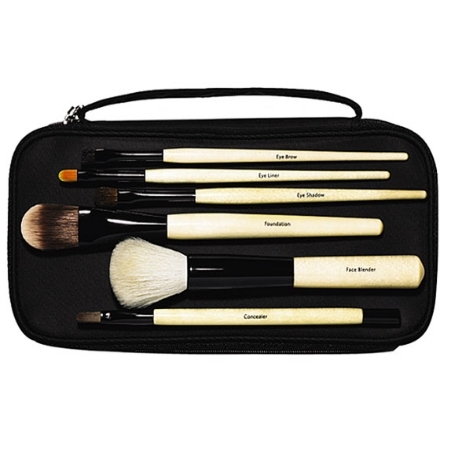 Deep cleaning is needed once a week or more often if brushes are used on multiple people. Use a moisturizing shampoo to remove makeup, rinse well and allow brushes to lay flat to dry overnight. 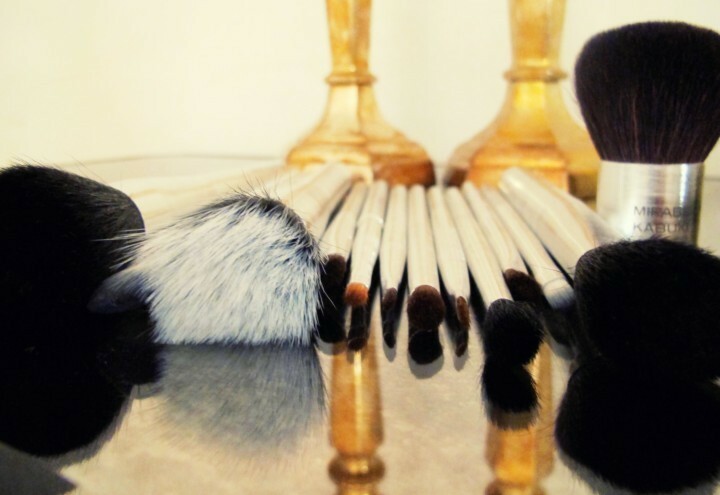 Your brushes will be beautiful for years to come if cared for properly. 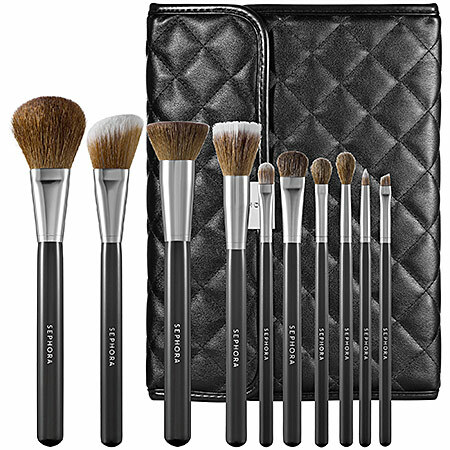 Buy one or buy all ($446.50), either way, peruse the Mirabella Beauty tools here, or TRY any of these convenient all-in-one brush sets: Bobbi Brown Basic Brush Collection ($190); Sephora Collection Prestige Luxe Brush Set ($125 / $325 value); Kevyn Aucoin Beauty The Expert Brush Collection ($245); Kevyn Aucoin BeautyThe Essential Brush Collection ($650 / $710 value *covet*); Laura Mercier Signature Luxurious Brush Set ($375).